According to Jewish authorities, the organ was one of the instruments of music in the Temple. In the Authorized Version rendering of Ps. cl. 4 the terms "stringed instruments" and "organs" used to translate the Hebrew "minnim" and "'ugab" are supposed by commentators to be misplaced, and it is held that "organs" is the proper translation of the first Hebrew word "minnim." Accordingly, Targum Jonathan translates "minnim" as "ḥalilin" (pipes, tubes); and in the second introduction to Mendelssohn's translation of the Psalms, "minnim" is accepted as denoting the organ. In modern Hebrew, however, "'ugab" is the equivalent of either "organ" or "piano." The Temple organ very likely was the "magrefa" mentioned in the Talmud as one of the instruments of the sanctuary. It is described by Samuel as consisting of ten pipes, each pipe having ten holes; a total of 100 notes was thus obtainable. An earlier baraita describes the size of the magrefa as an ell square with a board extension, on which were attached pipes capable of producing 1,000 different tones; but this number is thought to be an exaggeration ('Ar. 10b, 11a; see Rashi ad loc.). Apparently the extension was the keyboard, and the pipes acted as air-channels, as in the modern organ. Instrumental music in divine services ceased with the destruction of the Temple. Music was prohibited generally, in token of mourning for the destruction of Jerusalem, except on festal occasions and especially at the marriage ceremony in order to delight and make happy the bridegroom and bride. It appears that the organ was employed in nuptial ceremonies which took place in the synagogue. The Ṭur and Shulḥan 'Aruk (Oraḥ Ḥayyim, 338, 2) allow non-Jews to play musical instruments at weddings on the Sabbath of the week in which a wedding occurs, in honor of the bridegroom and bride. David b. Abi Zimra (RaDBaZ) in his responsa (i., No. 132) permits one to engage a non-Jew on Friday to play on Sabbath for a religious occasion. The modern organ in Reform synagogues as an accessory of worship was first introduced by Israel Jacobson at Berlin in the new house of prayer which he opened for the Shabu'ot festival, June 14, 1815. It aroused great indignation and opposition on the part of the rest of the community, a successful appeal being, made to Emperor Frederick William III. to close the place, on the plea that the Reform schism was detrimental to the established rights of the Jewish Church, and was especially disturbing to the Jewish congregation of Berlin. The house was closed Dec. 6, 1815. The members of the Reform party succeeded in building and (dedicating their first temple on Oct. 18, 1818, at Hamburg, where they set up a fine organ, but employed a non-Jewish organist. The rabbis immediately issued protests against the Reform movement in general and the use of the organ at the services in particular. 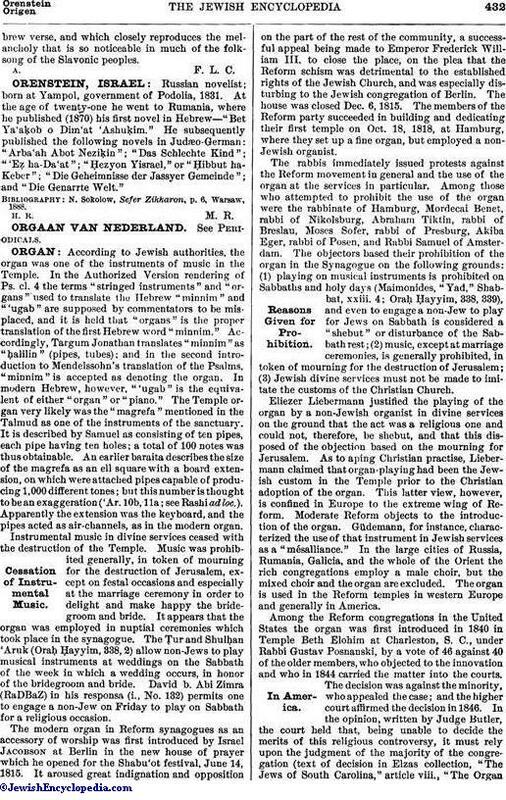 Among those who attempted to prohibit the use of the organ were the rabbinate of Hamburg, Mordecai Benet, rabbi of Nikolsburg, Abraham Tiktin, rabbi of Breslau, Moses Sofer, rabbi of Presburg, Akiba Eger, rabbi of Posen, and Rabbi Samuel of Amsterdam. The objectors based their prohibition of the organ in the Synagogue on the following grounds: (1) playing on musical instruments is prohibited on Sabbaths and holy days (Maimonides, "Yad," Shabbat, xxiii. 4; Oraḥ Ḥayyim, 338, 339), and even to engage a non-Jew to play for Jews on Sabbath is considered a "shebut" or disturbance of the Sabbath rest; (2) music, except at marriage ceremonies, is generally prohibited, in token of mourning for the destruction of Jerusalem; (3) Jewish divine services must not be made to imitate the customs of the (Christian Church. Eliezer Liebermann justified the playing of the organ by a non-Jewish organist in divine services on the ground that the act was a religious one and could not, therefore, be shebut, and that this disposed of the objection based on the mourning for Jerusalem. As to aping Christian practise, Liebermann claimed that organ-playing had been the Jewish custom in the Temple prior to the Christian adoption of the organ. This latter view, however, is confined in Europe to the extreme wing of Reform. Moderate Reform objects to the introduction of the organ. Güdemann, for instance, characterized the use of that instrument in Jewish services as a "mésalliance." In the large cities of Russia, Rumania, Galicia, and the whole of the Orient the rich congregations employ a male choir, but the mixed choir and the organ are excluded. The organ is used in the Reform temples in western Europe and generally in America. Among the Reform congregations in the United States the organ was first introduced in 1840 in Temple Beth Elohim at Charleston, S. C., under Rabbi Gustav Posnanski, by a vote of 46 against 40 of the older members, who objected to the innovation and who in 1844 carried the matter into the courts. The decision was against the minority, who appealed the case; and the higher court affirmed the decision in 1846. In the opinion, written by Judge Butler, the court held that, being unable to decide the merits of this religious controversy, it must rely upon the judgment of the majority of the congregation (text of decision in Elzas collection, "The Jews of South Carolina," article viii., "The Organin the Synagogue"). The minority finally withdrew and organized a separate congregation. The foremost Reform congregation of America, Emanu-El of New York, introduced the organ in its temple at 56 Chrystie street in that city in 1847. 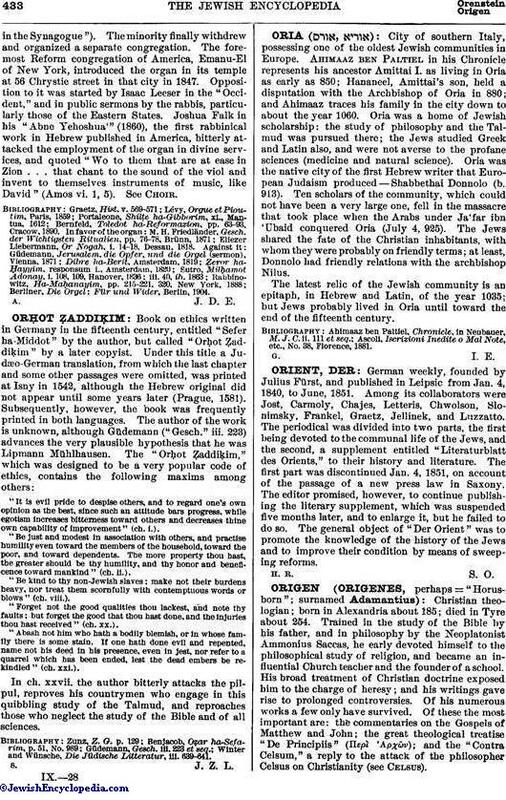 Opposition to it was started by Isaac Leeser in the "Occident," and in public sermons by the rabbis, particularly those of the Eastern States. Joshua Falk in his "Abne Yehoshua'" (1860), the first rabbinical work in Hebrew published in America, bitterly attacked the employment of the organ in divine services, and quoted "Wo to them that are at case in Zion . . . that chant to the sound of the viol and invent to themselves instruments of music, like David" (Amos vi. 1, 5). See Choir. Berliner, Die Orgel: Für und Wider, Berlin, 1904.